Cactus Horse Corrals, a division of CageCo Inc., is the largest manufacturer of corrals & shelters in the Western United States! With over 23000 sq. ft. of manufacturing and another 30,000 sq. ft. of warehouse, we strive to maintain the highest level of customer satisfaction by having the best prices, immediate product availability, and outstanding customer service. Whether you are in the market for corral panels, mare motels, stallion pens, arena, round pens, or any other of our products, we probably have it in stock and available for immediate delivery. 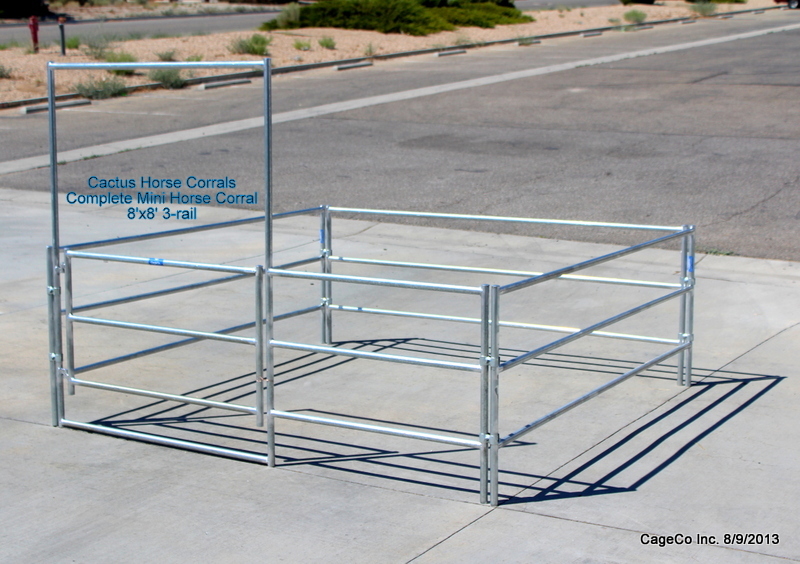 You can order our horse corrals and our horse corral panels in 1-5/8" or 1-7/8" tube with 4 Rail, 5 Rail, and 6 Rail. Additionally, we offer the largest line of welded wire horse stud panels in the industry. As the largest Manufacturer of horse corrals & shelters we only use American made components and materials in order to ensure quality & reliability. To find out more, or to place an order please call (800) 605-4859.